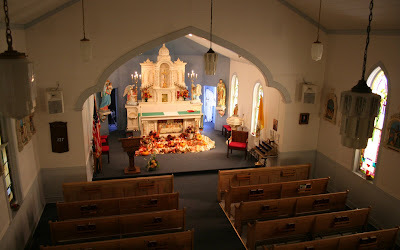 In 1883, a permanent parish was officially established in Bancroft by Fr. Nicholas Horn of West Point. 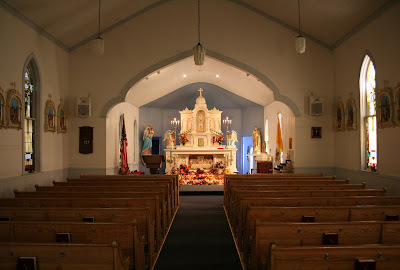 The parish consisted of roughly 30 families. The first church - which is currently the sacristy and sanctuary of the present church - was completed in 1883. In 1889 it was moved back on the property so that the present body of the new church could be built. It was completed in 1889. A detailed history of the parish is available here. The structure is an eclectic mix of Romanesque and Gothic elements. The sanctuary (the actual first church building) and its furnishings being primarily Romanesque and the nave being Gothic. The art deco light fixtures are a nice touch! 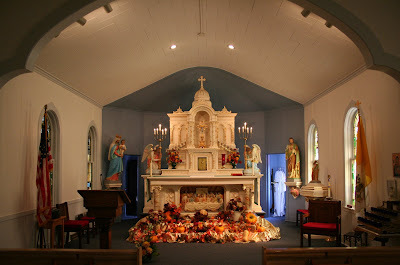 The small but elegant high altar adorns the sanctuary. The windows, which feature a unique Easter Lily motif were installed in the 1920s.